NetX is a powerful digital asset management software that simplifies the way business manage and share their digital properties, from photos, videos, and any other materials and files. 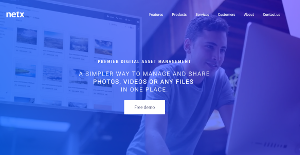 This cost-effective digital asset management system is easy to implement, enabling you and your team to adopt the software easily and incorporate it into your existing workflows right off the bat. NetX boasts a rich feature set, including a very intuitive user interface that offers three different views that are meticulously designed and developed for various use cases. The software is optimized for mobile use. Wherever you are, you can access your digital assets, manage them, and share them using your smartphone or tablet. NetX is a premier digital asset management platform that offers capabilities and functionalities other similar software can’t provide. The system is loaded with the NetX Gallery feature that gives you various views into your assets. You can opt to check your digital assets in a tile view fashion, brick and mortar style that maintains aspect ratio, or a list view that displays significant and relevant information about your assets. Searching for assets can be overwhelming especially if you have to go through tons of materials. NetX simplifies your search by letting you filter your search results with the “facets” functionality. That means you can trim down your results by incorporating specific custom attributes, creation date, file type and/or any other custom attributes into your search. If you are constantly working on a particular content, you can speed up your work by making regularly updated content visible by activating the “Saved Searches” feature. By making specific assets visible, you can easily track the content and its updates and changes. Even non-NetX users will love the system, specifically photographers. The software lets them upload their images and other files to a specific folder without having to log in or provide authentication credentials. Users can set the configurations for allowable data inputs to fully control the upload process from non-NetX users. Each enterprise has its own characteristics, and can require a particular type of Collaboration Software solution that will be designed for their company size, type of customers and employees and even individual niche they cater to. It's not wise to count on locating an ideal software that will work for every company regardless of their history is. It may be a good idea to read a few NetX reviews first and even then you should remember what the solution is supposed to do for your company and your workers. Do you require a simple and intuitive service with just elementary functions? Will you really use the complex functionalities needed by pros and big enterprises? Are there any specific tools that are especially beneficial for the industry you work in? If you ask yourself these questions it is going to be much easier to find a trustworthy app that will fit your budget. How Much Does NetX Cost? We realize that when you make a decision to buy File Sharing & Document Management Software it’s important not only to see how experts evaluate it in their reviews, but also to find out if the real people and companies that buy it are actually satisfied with the product. That’s why we’ve created our behavior-based Customer Satisfaction Algorithm™ that gathers customer reviews, comments and NetX reviews across a wide range of social media sites. The data is then presented in an easy to digest form showing how many people had positive and negative experience with NetX. With that information at hand you should be equipped to make an informed buying decision that you won’t regret. What are NetX pricing details? What integrations are available for NetX? If you need more information about NetX or you simply have a question let us know what you need and we’ll forward your request directly to the vendor.